First of all, it was very nice of you to help me--particularly with that box of clementine oranges that I was grasping awkwardly with two fingers while having 3 or 4 bag handles draped over each arm. It was obvious I was about to lose some oranges, so the help was very considerate. I liked how genuinely surprised you seemed when I greeted you each as "Elder" and asked where you came from. That you were both from rural Utah didn't surprise me very much--you both looked pretty intimidated by the heathen graduate students milling around our neighborhood. When you found out that I was nearly done with my PhD, one of you asked for suggestions for a good college major. My reply that a degree in engineering might be a good way to support a family was sincere--I worry about young LDS couples and their ability to survive in today's economy. That you both looked at each other and admitted that neither of you can do math reminded me just how very young you missionaries are, and I realized how hard it must have been for your mothers to let you go for two years. It probably seemed like the reason that I didn't invite you in after you helped with the groceries was because I was busy. But it really was because I didn't want the conversation: the one where I would explain about apostasy, about not going to church for awhile. And about institutions and inequity and history. About needing a new place to call home. About wounds. About the kinds of life experiences that couldn't be articulated to two nineteen year-old boys who don't even know what to study in school. 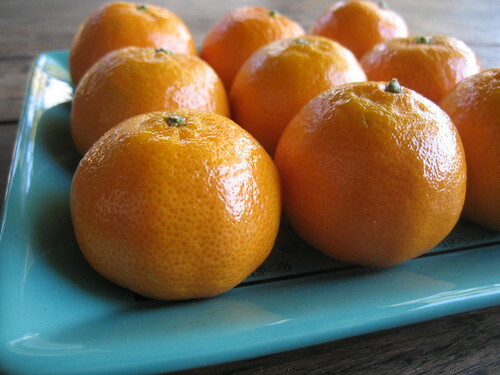 I wanted your memory of the afternoon to be one of rescuing a fellow Saint who was about to lose her oranges. Not of a lost soul for you to pity. And when I prayed, as you walked away in the rain, that you would avoid the doors of my neighbors who have been the most hurt by the Church's influence...that was one of my most sincere prayers in quite some time. Oh I just love this. I'm terrifically glad it was on top when I opened GoogReader. I am humbled by your care for the feelings of two representatives of an organization that has caused both you and John so much anguish. I am not nearly as gracious. I would have told them where to go if they had knocked on my door. Oh Jana. I so respect and admire you. Yesterday, when the missionaries came by for a visit, I ran and hid in the kitchen, leaving my poor husband to deal with them. When they didn't seem to be leaving, I escaped out the side door and ran to a neighbor's house. When she didn't answer the door, I hid in my own backyard, because I'd locked myself out the side door, and couldn't try to enter the front door, which goes straight into the living room. It was about 35 degrees, and I with no coat. I know I was rude. But, for the exact reasons you gave, I couldn't even speak to them at all. Bless you for your humanity. I usually avoid the computer because my mom's reading choices almost always make me cry, and my eyes almost always betray me and start reading anyway. I'm glad this was up when I woke this morning. Lightyears better than a message of hate; you are a wonderful person. So many people are kids who don't know much at all (like me). This is lovely. It captures my feeling that I don't want to turn these encounters into anything angry or bitter (I'm not sure how they felt, but as we ended the conversation, I shook their hands and wished them well). Recently I've found myself angry all over again at the church. I'm not sure why, but the wounds continue to resurface and fester. But I do tend to love the Mormon people that I know, and I hate to take out that anger on them--especially such sweet/naive kids as those missionaries--who remind me of my own kids and of my friends' kids so much. You crack me up so much. Take a coat next time, girl! I love this letter. For so many reasons. It made me miss you. We must be sure to have lunch in my neighborhood this month. I can't wait! Jana, thank you for treating these boys so nicely. We may not all believe what they believe, but we certainly all have a duty to humanity. You're both inspirational to me, and if anyone has a right to be angry, it's you guys...but you're not. I just adore that about you guys. I started talking to someone the other day in the pet store, and as I walked out to my car her saw my coexist stickers and made a comment about how they were interesting. I told him I was a Quaker, and he continued to tell me about Jesus and how he thought it was so sad that some of his older friends don't believe in Jesus- I said something like, well different things are good for different people, and he said that I seemed like a nice lady, and he was glad that I believed in something. I couldn't get into it with him- but I was happy that the way that I reacted was not in ager or frustration, but rather acceptance. I think that the way that you treated the young men is such a testimony of the values you have and the beliefs that you have about accepting others and being kind to others. I love the entry...and I also love the picture. Beautiful! What a beautiful letter. I'm sorry to hear that your feelings of anger have been resurfacing (happy to talk with you about that anytime, Jana, as we would have so much to share). I find myself torn over the missionary visits, too. I hate it when they knock, and I want them to go away, but I remember that before my husband left the faith that was him, a young naive 19 year old doing what he believed at the time was the right thing to do (because he'd been told so all his life). You dealt with both situations perfectly. Those missionaries might someday be like Chris and John are now: outside the church with a whole new sense of the world. They are less likely to be open to new and different ideas, though, if people like us treat them like crap just for doing what they've been told and for following their 19 year old hearts. It's a journey, after all, isn't it? Jana, I swear: sometimes your blog brings be back from the brink. Wonderful piece of writing, Jana. I have issues with missionaries, but I don't dislike them on a personal level and only wish the best for them. They're doing what they believe they should be doing, and it's difficult to fault anyone for that, even when I believe they are being wrong-headed. Also, I hear you about the anger issues. I'm currently trying to compose a letter of resignation from the church, and I've noticed those feelings bubbling up again from time to time. It especially seems like kind of a strange head-space to be in as I'm starting to get my ducks in a row to go back to school do an individualized masters program revolving around belief systems and how they affect individuals, institutions and society. Your prose here is excellent. Spare, but heartfelt. Really well done!! Thanks for validating my angry feelings. It's hard to feel this way--I don't like feeling anger, though I know it's a natural part of the process. Your praise means much. Thanks. Good can come of FMH being down. Serendipity (and sidebars)led me to this beautiful post. Thank you for coaxing me toward more patience and understanding. I cried when I read this. It's beautiful and truly respects everyone's feelings. My son is a mormon missionary. Personally, I invite the local missionaries in when they come by, I even feed them on occasion. I don't explain why I don't go to church and they don't ask. We just enjoy each others company, meet on some kind of common ground, and so far it is somehow working out. As an ex-Mormon, I too struggle with how to react to the young missionaries who come to my door. Your letter describes what I feel to be a perfect example. I'm sure they left your home feeling positive. My younger sister completed her mission several years ago and the stories I heard from her of how cruel strangers were to them at times made me sad. Even though I don't personally agree with what my family believes, I have to remember that they are simply doing what they feel to be the right thing. Thanks everyone else, for your comments here. I love the idea of the audience who reads Jana's words regularly, like I do, think alike despite our differences. What a wonderful community to be a part of. I'm so far behind on my blog reads, but am so moved as I just read this now. Thank you, Jana. I love your blog.